We at FIREBREW Bar & Grill know that we are the best when it comes to finding great restaurants in Virginia Beach, but you don’t have to take our word for it. We pride ourselves on having a true open-concept kitchen where diners from all over the restaurant can see their food being prepared. We also offer a self-service wine station that allows you to take a small sip of any wine you would like or to purchase a full glass to enjoy with your meal. Of course, all of our food is prepared in our incredible Fire Deck oven, so you can rest assured that all your meals are freshly cooked – no microwaves or fryers needed. If that isn’t enough to convince you to swing on down to our bar and grill tonight, then perhaps our daily specials may tempt you! Each and every weeknight, we offer our customers a reason to come in and dine with us. All of our specials are valid from 4pm to 9pm daily unless otherwise noted. Keep in mind that they won’t be available with any other offer, coupon, or discount! We are proud to offer 15 percent off all meals to those who are either active or retired military, police, firefighters, and first responders. This excludes alcoholic beverages. If you are looking for the perfect date night, Tuesdays might be your new tradition! We offer a buy one entree and get one at half price, so you won’t have to worry about breaking the bank to treat your sweetie to a meal. You’ve made it halfway through the week – you’re almost there. Since we are halfway through, feel free to enjoy half off on all appetizers and bottles of wine. We are that much closer to Friday, so you might as well celebrate! Thanks to you and your support of FIREBREW, our bar and grill has become one of the top ranked restaurants in all of Virginia Beach. Because of your loyal support of our business, we want to say “thank you” by offering all our customers half off all pizzas and flatbreads on Thursday evenings. If you are looking for someplace to take the family on Sunday evening for dinner, bring the kids to FIREBREW! Kids 10 and under get to eat free when they order from the kids’ menu and you purchase a meal for yourself. This offer lasts all day, so lunch is also the perfect option. 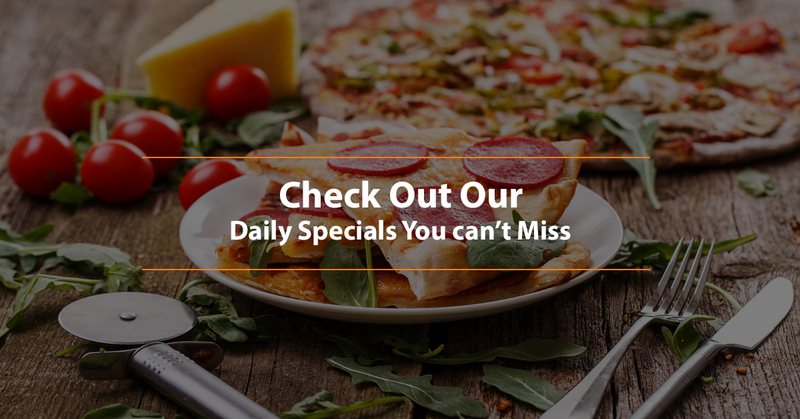 Come into FIREBREW Bar & Grill today to indulge in one of our daily specials! We want to thank you, our customers, for trusting us time and time again to give you that perfect meal to wrap up the day. If you want to come in on the weekend, we’d love to have you then, too. Order one of our beers or try out our Wine Station! We look forward to seeing you soon.